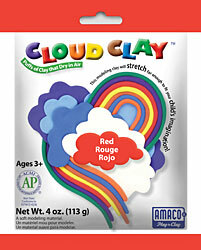 If the kids of one of our employees were writing this post about Cloud Clay they would say "We love cloud clay!" This clay will stretch more than most other clays, feels dry and soft to the touch, and holds its shape well. It will dry over night so that it can be decorated the next day. It is available in 10 colors and we stock 2 of the colors. If you want to be more creative, we can order the other colors for you.